Ubuntu has been one of the top two distributions in Linux for a very long time, yet this is the first time I have really used Ubuntu for more than a week. I prefer Linux Mint, which is derived from Ubuntu. I used the 32-bit version of 12.04 LTS for this review. Some people have questioned why the default is to recommend the 32 bit version, but I have to agree with this decision. There are still a few points when running Linux where 64 bit versions will hit minor snags. They aren’t things that intermediate Linux users can’t fix, but people who are just starting out on Ubuntu will appreciate having fewer problems. The installation was straightforward and doesn’t intimidate, and I appreciated the presence of an option box to check whether you want to install codecs right then, instead of doing it later. Linux Mint just goes ahead and installs them by default. Your user password strength is indicated, and my wireless security key was carried over from the live session. I think the default wallpaper is quite ugly, and switched it as soon as I could. Luckily, you have quite a few choices in the Appearance section of the System Settings application. That is also where you adjust how wide the Unity bar is on the left side of the screen. 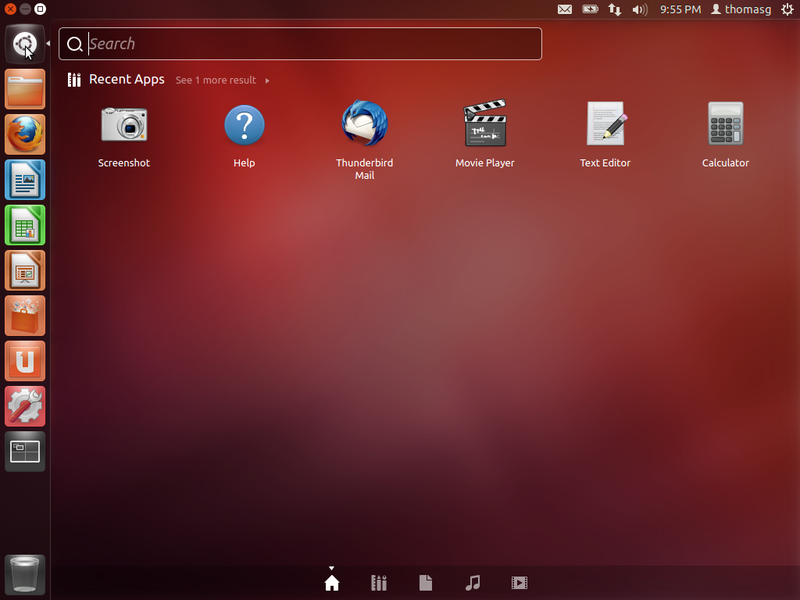 Unity was created by Ubuntu, their vision of a desktop user interface that can be (hopefully) used on tablets. The first time that I tried to use it was in its infancy with the 11.04 edition, Natty Narwhal. After 2 days, I’d had enough and returned to what is now termed the “fallback” session. I also installed a couple of other desktops, Xfce and KDE. The Unity sidebar can hold 21 icons at size 32 (the smallest) before the last few start to flatten. They are easy to pull off and move to a different spot on the bar, and you can lock any open application with a single click. If you scroll your mouse, the bar moves up to let you access the last ones more easily. You have very few customization options unless you install programs such as MyUnity or Gnome Tweak Tool (called Advanced Settings), both available in the Software Center. Also found there are a number of apps such as an alarm clock, a weather app, and other little useful items. The Dash – When you click the top icon on the bar, or just hold your “super” key (usually the Windows symbol key) briefly, the Dash comes up. This lists recent applications, recent files, and recent downloads, and has an area to search for things you need, in a similar way to GNOME Shell. This search area is known as a Lens, and you can add several more that have been made especially for uses like Wikipedia, Youtube, Spotify, even Flickr. (There’s one for Grooveshark too, and I may have to check that out). The HUD – The Heads Up Display is activated with your Alt key. This brings up a different set of choices than the Dash does, and the list varies depending on what applications you have open – HUD tries to match your search with the menus on all open programs, with somewhat mixed results. In the picture below, you can faintly see that I have both Firefox and a Terminal open. Both the HUD and the Dash notably avoid using the mouse. A lot of power users of Linux insist that keeping both hands on the keyboard is more efficient than moving one from the keyboard to the mouse, moving the mouse around the desktop, then returning that hand back to the keyboard. I think learning how to use the Dash and the HUD effectively will take some practice; The HUD especially seemed to have trouble guessing my meaning, but that is undoubtedly because I don’t fully understand the best ways to use it. When you first start Ubuntu 12.04 after installation, the sidebar holds your home folder, the Firefox browser, 3 LibreOffice programs (Writer, Calc, Impress), the Ubuntu Software Center, a link to the Ubuntu One cloud storage, System Settings, and the Update Manager. There’s an icon called Workspace Switcher below all of these, which will let you move between the 4 default virtual workspaces. I give Ubuntu credit for making sure this useful utility is on the bar. I have used some Linux distributions where you are set up with 2 or 4 virtual workspaces, yet because it doesn’t show on the taskbar, I didn’t realize immediately that I had more than one ready to use. At the bottom is the Trash icon. With the media codecs installed, all my favorite media sites worked perfectly – Apple movie trailers, Hulu, Grooveshark, and Youtube. As you can see in this picture, there are a large number of games readily available through the Software Center. 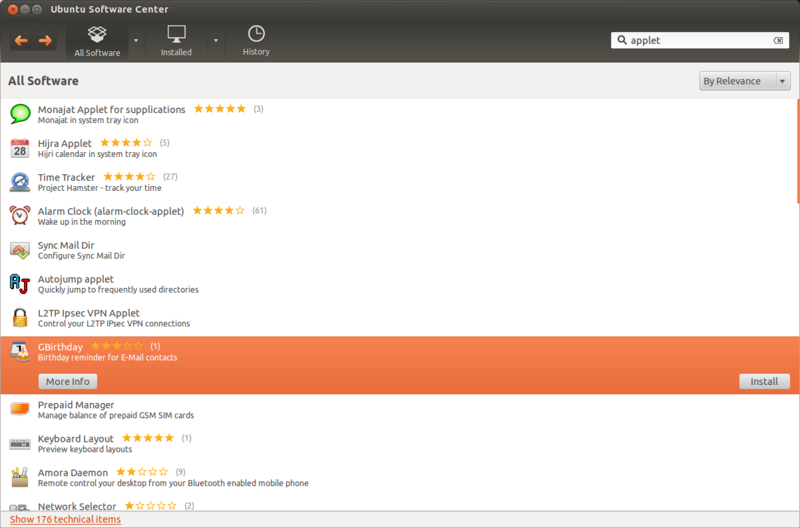 Ubuntu seems to strongly encourage you to use their Software Center, and hasn’t included the standard package manager for most Debian-based Linux versions (Synaptic) by default, although you can still add it later. Emulators, DOSbox, and Wine can be installed using the Software Center as well. I think that a few games which are not quite as well known are only in the regular repositories and you’ll need to install Synaptic to find and install them. Surprisingly, “FPS” and “strategy” games aren’t given their own categories at the top. Ubuntu is, for the most part, a solid and trustworthy distribution. The Software Center is very well put together and looks great. 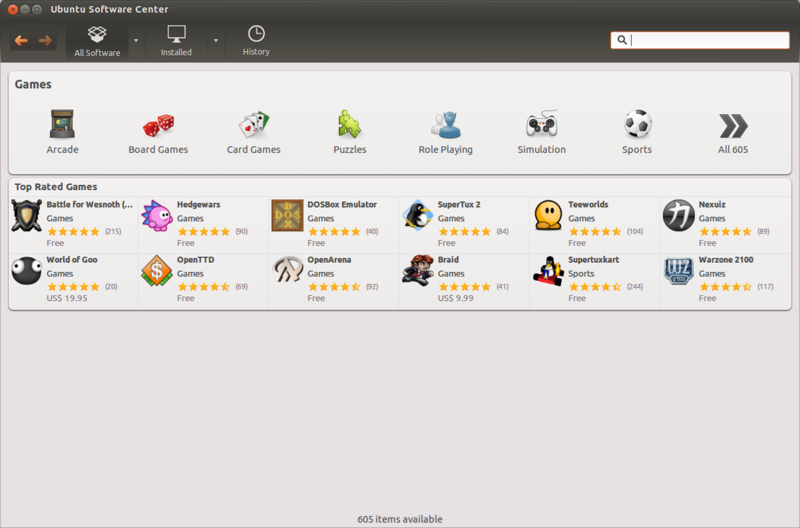 I approve of Ubuntu selling games and magazines via the Center. The perception that Linux users will never pay for good applications is false, but the myth may be holding back some developers from making a version of their software for Linux. Installing a few casual games by default always gets appreciation from me. I have said many times, all distributions aimed at home users ought to be doing this. The Firefox browser is prepopulated with a few Ubuntu related websites. 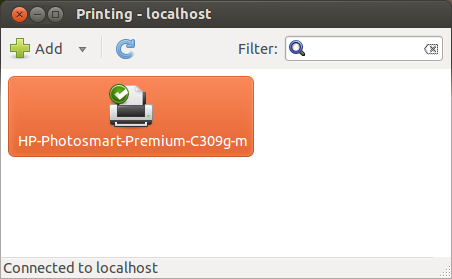 Ubuntu easily detected my HP wireless printer and added it, using the HPLIP library rather than CUPS. I didn’t even have to choose which HP printer from a list. In any browser that puts its menu up on the top Unity bar, you cannot right click to perform operations on the bookmarks. This is, for Firefox, a major change in expected behavior and it only happens when using the Unity desktop. The reliance on Unity as the primary desktop means that if you ever move away from Ubuntu, you have to learn one of the others. This is because only a handful of other distributions are using Unity as their default desktop, and none of them are well known. For gamers, the Getdeb unofficial repository with extra games is not included by default as it is in Mint. Also, I was surprised to discover that in the Software Center, the featured game Battle for Wesnoth has an outdated link to version 1.8, which is no longer in the repositories! Version 1.10 is available but doesn’t show unless you search for “wesnoth”. I hope that there aren’t any other popular applications that have this issue. I suspect that because 1.8 has more reviews, it shows up on the front page of Games. But the link to install the file ought to either find the current one, or provide a message such as “there is a newer version of this game/application available. Would you like to install it?”. 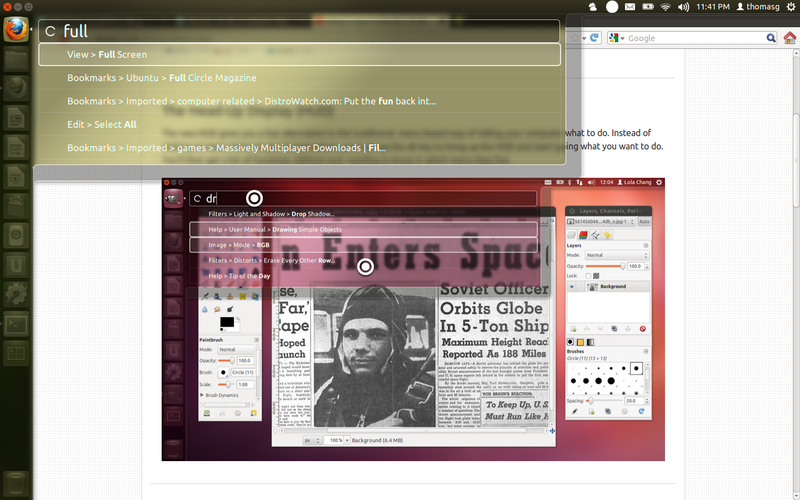 There are a few minor quirks that I didn’t expect from Ubuntu. The worst is that when shutting it down, it sometime hangs before powering off, and I have to turn off the laptop manually. I don’t know whether it’s doing this on other laptops, but I have never had this issue with any version of Linux before. 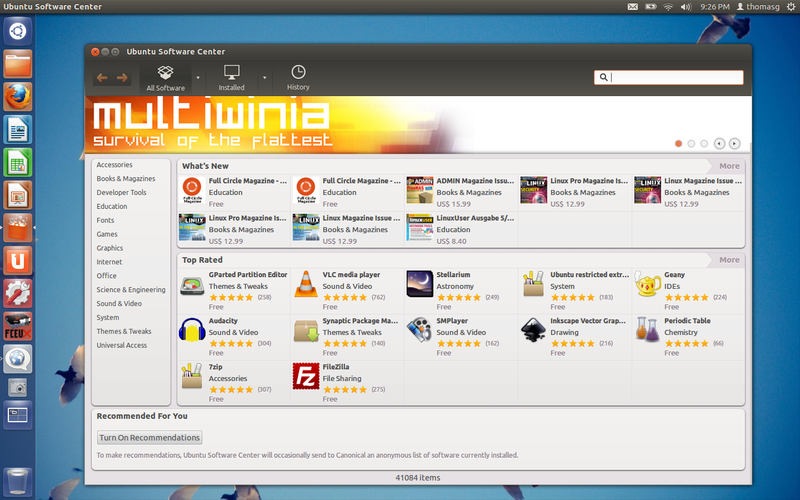 Even though I still prefer Linux Mint, I’ll admit that Ubuntu is definitely a very well put together distribution. Everything worked as expected and of course they have the huge Debian repository base to draw from. Most people will find it to be just fine, and again I will say – don’t decide that Unity is not for you without giving it a try. I prefer using KDE, the regular GNOME Shell, or Cinnamon, but Linux is all about choices. There are plenty of people who really like Unity. 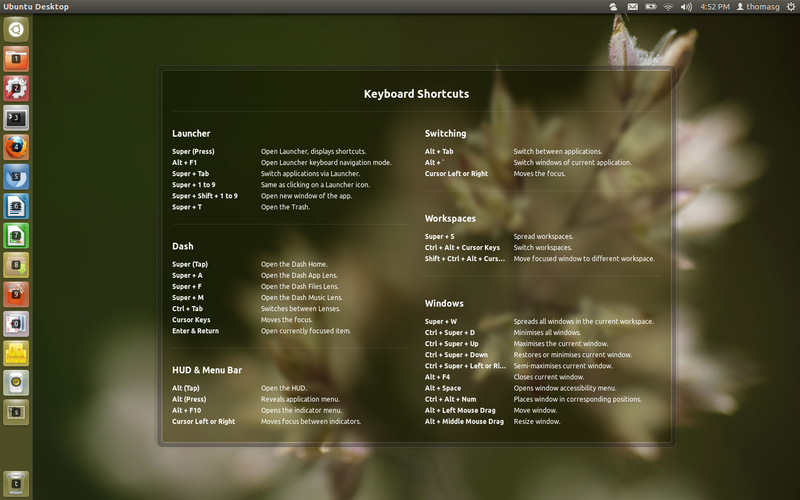 If it does bother you, you can add the KDE, Xfce, LXDE or Cinnamon desktops to Ubuntu, or just use the GNOME Shell. Thanks for catching that! I have fixed it. Thanks for an unbiased review but, sadly, Unity isn’t for me. I kissed Ubuntu good-bye with Mint 11 and have never looked back. Mint is the perfect “fit” for me.